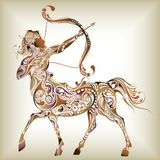 The Sagittarius New Moon occurs on Monday, December 2nd at 5:22 pm MST at 10 degrees Sagittarius 59 minutes. Here’s the chart: SagittariusNewMoon2013. Sagittarius is the sign of the Seeker who wants to understand him or her self and the entire cosmos in philosophical, religious, spiritual or metaphysical terms. Typically, this sign studies and travels extensively (both inwardly and outwardly) in an effort to expand its conscious awareness and understanding of universal truths. Sagittarius is the Centaur, half man and half horse. This glyph symbolizes mankind’s ancient history of conscious alignment with the natural world. In pre-patriarchal times, humans lived in harmony with natural laws. Sagittarius is also an Archer who’s arrows shoot towards the heavens where cosmic truth and wisdom reside. Jupiter rules Sagittarius and is currently retrograde in the emotionally vulnerable sign of Cancer. This symbolism reflects a desire to seek expanded understanding of security needs. But Jupiter is also currently connecting with the square between Uranus in Aries and Pluto in Capricorn – the revolutionary aspect associated with the profound social, political and economic changes occurring all across the planet. Expect emotional insecurities to bubble up to the surface. Venus in Capricorn focuses attention on love and money for the next three months. Retrograde from December 21 until January 31, Venus will initiate a necessary review of resources and relationships. Of course this timing will coincide with current congressional budget negotiations and the next debt ceiling limit deadline! Sagittarius also rules the right brain and intuition. Its counterpart (opposite sign) Gemini rules the left brain and logic and feels secure when it can name, label and classify, and thus know, the physical world. Sagittarius intuitively senses that there’s more to reality than the physical world that we come to know through our five physical senses. Sag seeks to go beyond the physical world to the metaphysical world and the natural laws responsible for the physical manifest creation. Sagittarius rules our sixth sense, intuition. With Jupiter now retrograde in Cancer, its time to follow your own intuitive guidance. Journey inward to seek answers. This will bring a sense of peace, greater balance and emotional security. It will expand your understanding of your personal security needs. What do you need to feel safe, secure, protected and at peace? The Sun and Moon trine retrograde Uranus in Aries offer encouragement to make necessary changes. This favorable aspect also confers an instinctive creativity that supports innovative solutions and ideas. Uranus stations direct on December 17 bringing breakthroughs in awareness and revelatory insights. Get ready for classic ‘AHA’ moments! Jupiter’s trine to Saturn in Scorpio and Chiron in Pisces (Grand Water Trine) provides the maturity and inspiration for a deep understanding of wounds that still need to be healed. Doing this inner emotional work will be transformative and empowering. Jupiter trine Saturn can bring rewards for all the work you’ve put into something that began in your life in the Spring and early Summer of 2000. Inwardly and outwardly, this month promises great leaps forward for those who’ve made the effort to evolve beyond old outworn habits and beliefs. The Capricorn New Moon is on Wednesday, January 1st at 4:14 am MST. Copyright 2013. Donna Lee Steele and Threshold Consulting. All rights reserved. This entry was posted in Planetary Events and tagged Cancer, emotional security, Grand Water Trine, intuition, journeys, Jupiter, natural laws, Sagittarius, travel, truth, Uranus square Pluto, Venus, wisdom. Bookmark the permalink.